Saturday afternoon, 3pm, the Ricoh Arena – two giants of European rugby will collide and only one will be left standing as Saracens take on Munster. As we approach the business end of the season the games only get bigger and this one is a huge clash for English champions Saracens, as they look to re-claim their European crown. Two-time winners face two-time winners and a pulsating encounter is expected – we’re taking a look at all the build up ahead of this European Champions Cup semi-final. A place in the May final at St James’ Park in Newcastle awaits for the winner of this tie, with Leinster Rugby and Toulouse contesting the other semi-final in Dublin on Sunday. Whoever prevails between Saracens and Munster will know they are just 80 minutes away from a third European crown, the Londoners lifting the trophy in both 2016 and 2017, and Munster triumphing in 2006 and 2008. Quite simply, Saracens have been outstanding in this year’s Champions Cup, staying unbeaten after they battered Glasgow Warriors 56-27 in the quarter-finals. Mark McCall’s men enjoyed a flawless pool campaign and look in the mood to claim the title once again, but then all four teams in the semi-finals are in exceptional form. Munster’s quarter-final was more nervy but no less impressive as they triumphed 17-13 at BT Murrayfield against Edinburgh, displaying their famous composure in knockout rugby. Looking at the statistics so far Saracens have been the more ruthless, 30 tries to Munster’s 16, and they’ll hope the fixture in England could help turn things their way. These two last met in 2017, coincidentally a final four clash in Europe’s elite competition. Saracens fly-half Owen Farrell kicked 16 points as the English side took a step towards a second successive Champions Cup with a comfortable 26-10 win in Dublin. The Irish province dominated the first half possession and territory but could not convert that into points, trailing 6-3 at the interval after two Farrell penalties and one from Munster fly-half Tyler Bleyendaal. Saracens prop Mako Vunipola was bundled over the line for the game’s first five-pointer, before Farrell kicked two further penalties to extend the visitors’ lead at the Aviva Stadium in front of a near sell-out 51,300 crowd. 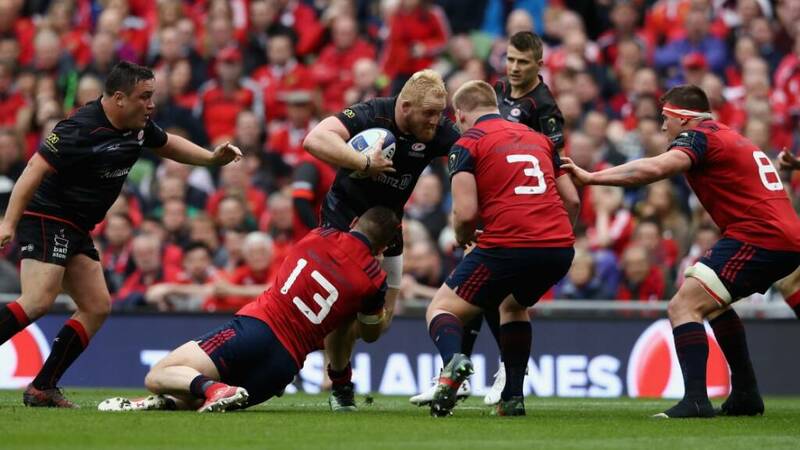 They pulled further clear through a try from utility back Chris Wyles and despite a consolation score from Munster No.8 CJ Stander, Saracens eased to a third European Cup final in four seasons. In that final Saracens clinched a second European crown with a 28-17 victory over ASM Clermont Auvergne at BT Murrayfield, with tries from wing Chris Ashton, lock George Kruis and full-back Alex Goode. Both sides are filled with key players who have been leading the club and international game for a number of years, all capable of decisive moments on the grandest stages. For Saracens, fly-half Farrell is always crucial and among his side being the top scorers in this year’s competition (241 points), Farrell has 57 of them. His big-game composure is matched by the versatile Maro Itoje, equally as influential at lock or in the back row, when Itoje plays you get the feel his presence lifts the whole side. That’s a statement that could also be made of Munster No.8 CJ Stander, who always displays tireless work-rate and has the most tackles in the Champions Cup this year – 112. Munster also lead the way in the number of turnovers, 56, Tadhg Beirne has made an astonishing 14 of them and will need to be marshalled well at the breakdown at the Ricoh if Saracens are to prevail.